Standard features Best in class power density: More real power in watts, 0.82 to 0.9 pf on the 1, 1.5, 2.2 and 3 kVA models. 0.85 pf on 5 kVA and Unity on 6 kVA – 10 kVA units. Additional features Embedded network management card with environmental monitoring (5 kVA – 10 kVA models): Remote monitoring and control of the UPS and the environment via Ethernet connection while freeing up the SmartSlot so customers can add accessories for additional communication options. 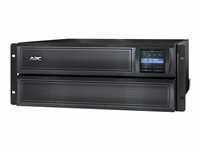 APC’s SMX3000HVNC is part of the award winning Smart-UPS family which is the most popular UPS in the world for servers, storage and networks. 1. 4U Rack/Tower Short Depth Convertible Form: Display rotates easily for use in or out of a rack. APC's SMX3000RMI2UNC is part of the award winning Smart-UPS family which is the most popular UPS in the world for servers, storage and networks. The 2700W 3000VA extended runtime UPS is trusted to protect critical data and equipment from power problems, and supplies clean and reliable network-grade power. In addition to legendary reliability and manageability, Smart-UPS units have extremely high efficiency at low, medium and high load levels, making them ideal for today’s multi-core or virtualized servers that have varying load consumption.